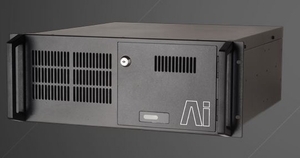 The Ai T4 and T8 offer 4 & 8 Display Port / DVI outputs in a solid industry-proven, shock mounted steel chassis. The system is supplied with a fully featured Ai Miami Licence. This allows for 8 discrete fixture groups with 4 layers each, producing a formidable 32 media layers. Furthermore, the Salvation Engine may easily be configured to provide up to 64 layers or PIP’s with a single server! • Up to 4 full 1080p HD outputs (T4) or 8 full 1080p HD outputs (T8). • Salvation node based engine.